Books and other things: Let's all start over again! Let's all start over again! January the First as New Year's Day is a man-made matter. In the olden days when men lived by the natural clock the new beginnings were at O degrees of Aries on the 21st March, the Spring Equinox. That's when the northern hemisphere, the world where the majority of people then lived, began to wake from its long winter sleep and 'young men's fancy turned to thoughts of love.' Now a young man's fancy is always on thought of love; there's no longer the need to endure the coldness of unheated rooms to chill passion till the warmer weather awakens it. Our Western concept of New Year's Day has taken over. My son, who is at present in Nanchang, tells me that even the Chinese have a day off for it probably because there's no one in the Western Hemisphere sober enough to trade with. However, it's a good concept. We need a boundary line to cross in life each year. 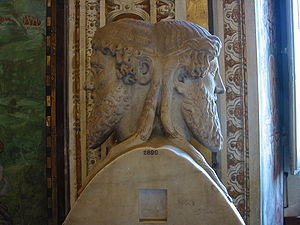 We need, like Janus, the old Roman god of the doorways, gates, ends and beginnings, to be able to look backwards with one face and forwards with the other. This time of reflection, this standing on the threshold of every year is good for us. We can look over past mistakes and hope, promise never to let ourselves do anything so foolish again. Each year we may well look back and realise to our dismay that we have committed the self-same errors in different forms - but it doesn't matter. We have to keep looking, seeing, understanding, trying. And each year the mistakes do lessen a little. It 's a bit like Catholic confession. We sin, we repent, we confess, we try hard and then sin again. It's the constant turning of the wheel and part of the human condition. We always wish for a happy new year and some years are downright awful and some are landmarks of important and glad happenings that have turned our lives around. But there is never a year that is totally bad or totally good. Always something to be rescued, some moment of joy, beauty, shared love, a special holiday, a meaningful achievement however small. Oh, pass me the gin and tonic! It's all too depressing remembering the idotic things I've done in this past year. Will I never learn? All the same, 2010 is going to be my year. Just watch. I've made up my mind. Um-hmm.